We have traveled all through Mexico. We've seen the pueblos, beaches, mountains, colonial cities, border towns and Mayan ruins. However, other than going through the airport to transfer planes, we have not seen the great capitol of Mexico, Mexico City itself. Neither of us are big city people to begin with, preferring large towns or small cities to the metropolitan areas famous throughout the world. Of course we have visited San Francisco, Miami, Rome, Paris, New York City, Quito and others, but often we get lost in the concrete, the congestion of traffic, the jungle of street signs, the emotional distance of the residents and the red and blue lines that crisscross a tourist map. 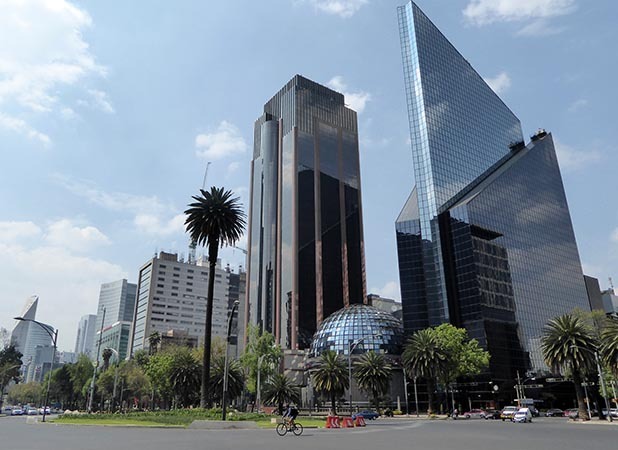 That being said, there's a pulsating energy to highly populated megalopolis areas like Mexico City. 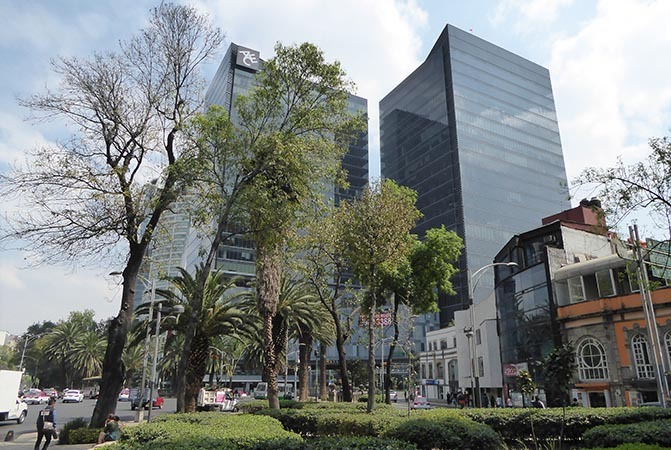 Not far from our hotel in the city's center is a main artery called La Reforma. Here you will find beautiful glass skyscrapers and graceful, stately buildings. They are cutting-edge design and make for a stunning skyline. I'm not versed in architecture so I don't know what style this corner building represents. It looks European to me, perhaps a bit Nordic or German. Fortunately we didn't observe a lot of graffiti in the city but here you can see some in the lower right of the photo. 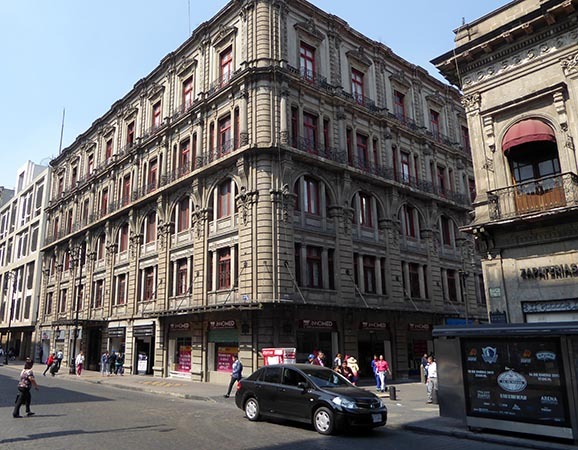 This color of red on walls is very common in Mexico and Central America. 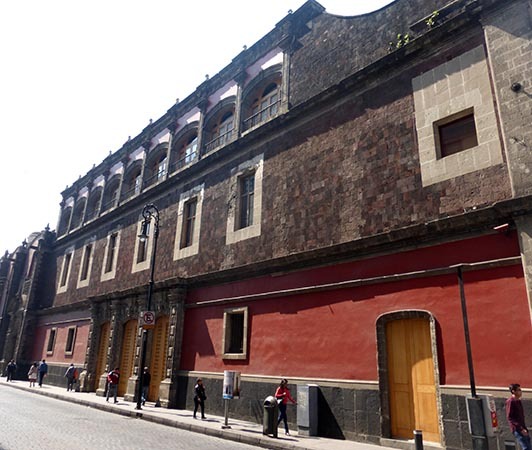 In Guatemala, it is called "Mayan Red" because the Mayans love this color, painting many of their historic buildings this shade in centuries past. I'm not sure what the color is called in Mexico, as the Aztecs were the native peoples in much of this country. Streets in the city of Mexico were consistently clean and - surprisingly for such a large city - the people were very friendly. Sidewalk cafes were everywhere as we walked through the city. 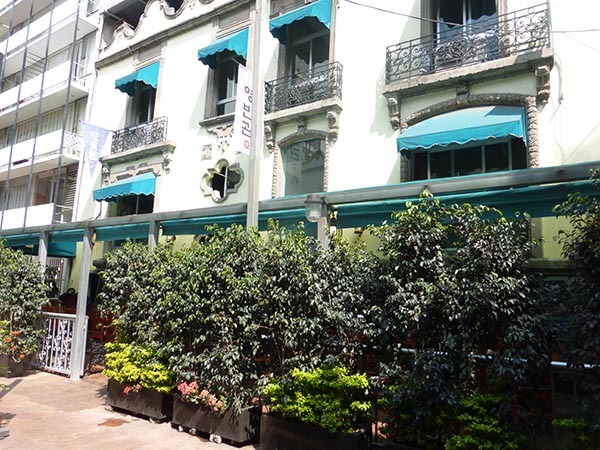 This one has a bit of Paris flavor with the ornate wrought iron, the awnings and the privacy provided by the ficus trees and planted bushes. Restaurants and cafes are everywhere. 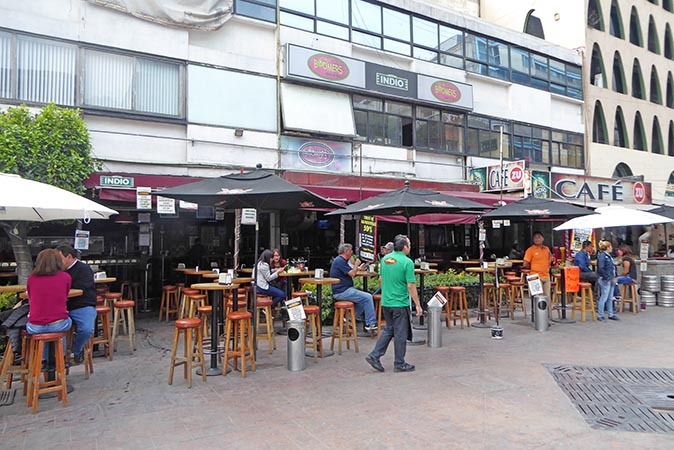 We noticed that during the week, foot traffic was thick, and restaurants and cafes were full. All the workers from the office buildings were looking for lunch! But come the weekend, this area was quite vacant. This building was in great condition and reminded me of many buildings I have seen in the mid-west from the early 1900s. All of the areas of the city that we saw were manicured and in beautiful shape. 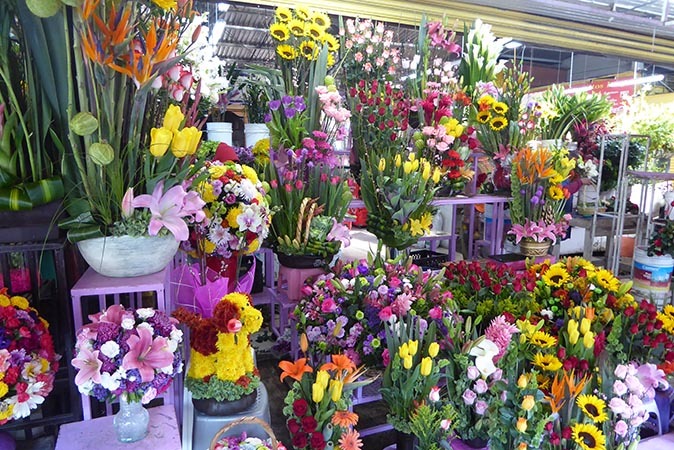 Just around the corner from our hotel were several floral shops with beautiful displays. Notice the little dog in the lower middle of the photo, and the amazing lilac lily type of flowers in the lower left. Birds of Paradise, sunflowers, tulips, mums, roses... all the shops had impressive arrangements and a wide variety of tropical flower choices. At our border crossing we were in a peddle cab that was a far older version than what you see here. 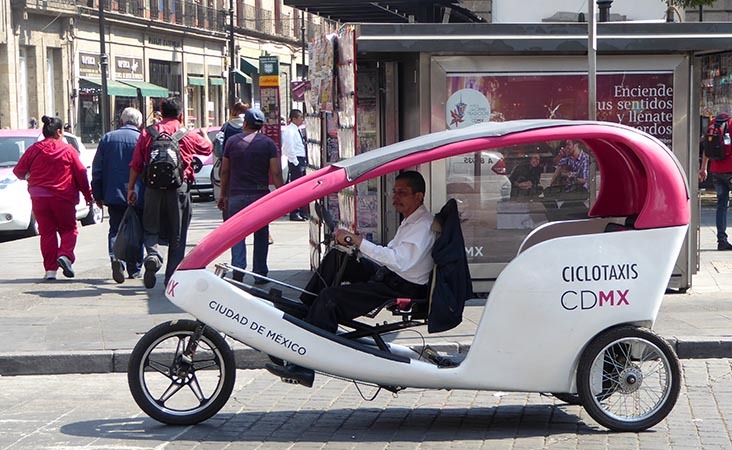 This ciclo taxi has far more modern lines in its design and I imagine is better for the body and easier to peddle. Notice how smooth the streets are, not the cobblestones of the olden days, but rather a newish paver style, less challenging to walk on and to navigate in a vehicle. The old style cobblestones wreak havoc on your ankles and hips, and for vehicles, rattling everything loose, from your side mirrors to your glove box. As the city grows and moves into the future, the difference in the styles of the buildings side by side is obvious. At one point, 3, 4 and 6 floor buildings were the most modern ones built. But you can see here that the 20 or 30 floor skyscraper in the background now overtakes these older constructions. It's the same all over the world these days. 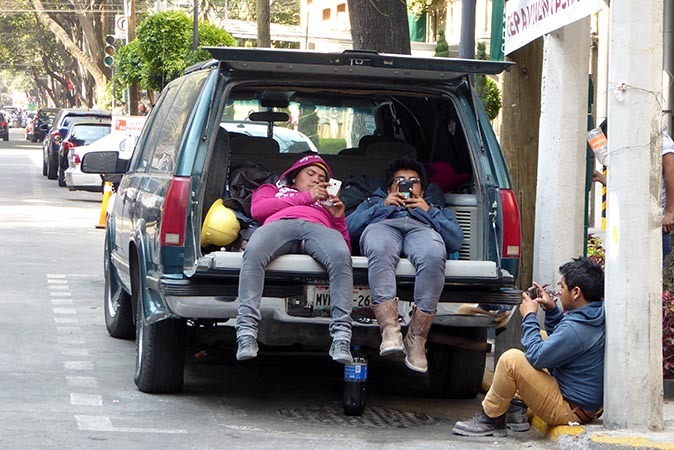 People are mesmerized by what's going on with their cell phones. Here you see some construction workers taking a break and probably checking their email or Facebook pages. A bottle of sugary, caffeinated soda is on the street between them. I have gone to stores where young people employed as grocery baggers have their phones on the shelf in front of them, beeping, booping and texting as they bag my purchases. 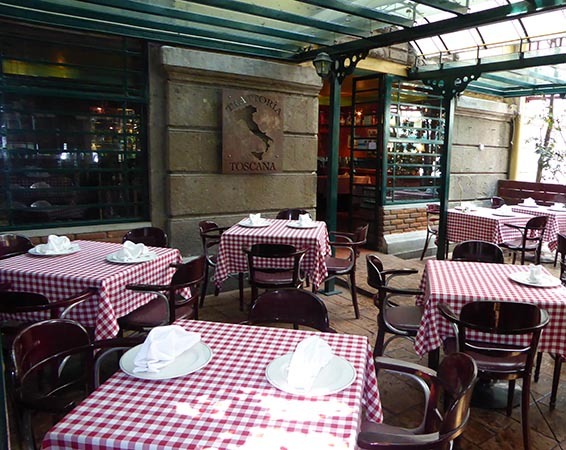 As we walked back to our home neighborhood, we saw this beautiful outdoor restaurant which was a school that taught French cooking. We would have loved to eat lunch here, but it was gated to the public. Modern architecture was everywhere with glass, mirror, graceful curves for the sides of buildings being common place. Notice how clean the walking areas are. There are trash cans readily available, and there are no broken steps or undulating bricks on the walkways. 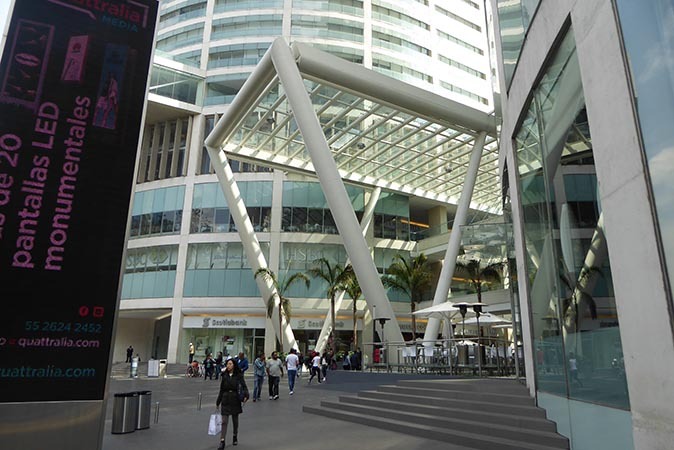 Avant-garde buildings make for a beautiful central area in Mexico City. We noticed a generous mix of greenery all throughout our city travels, including vertical gardens that help with city pollution. Right across the street from the ultra-modern city center of the previous photo are these buildings showing an older style of construction. Stone and stucco, thicker walls, arched windows; a bygone era. 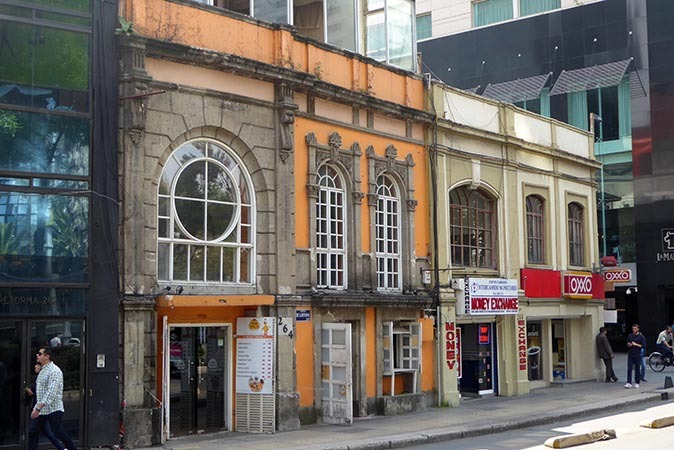 Here you see the same older buildings we just showed you, and they are right next door to more of what appears to be a revolutionary style of construction. Can you imagine what the people from that previous time might think if they could see their streets today? 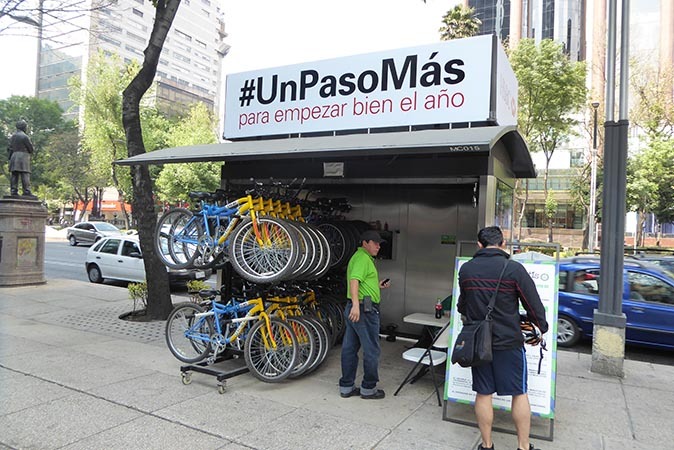 We saw bicycles and bicycle stands to park them "everywhere" in the city. How convenient! I imagine one can rent the bicycle for the hour or by the day and what a great way to get around the center of the city. 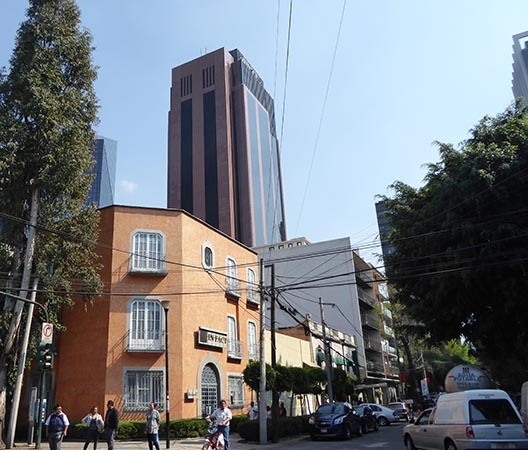 By the way, and much to my surprise, the air in Mexico City was clear and clean. I have seen terrible photos in years past that have shown thick brown or gray haze and happily, this just wasn't the case during our visit. International restaurants of all kinds lined the streets as we walked around. 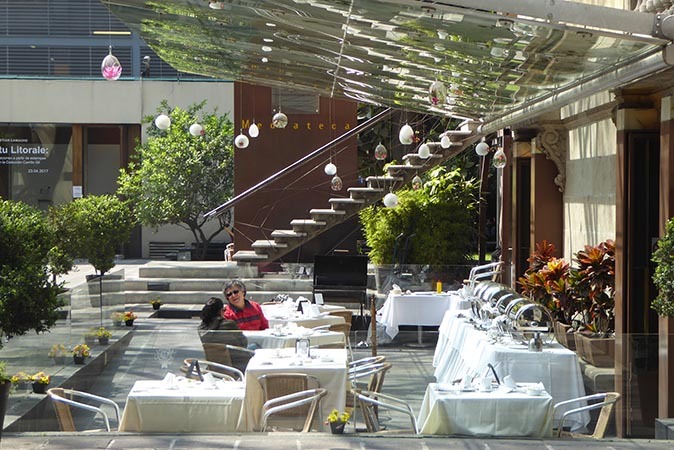 Decorative wrought iron often separated one from the other, with potted gardens to add privacy for diners. Different from the restaurants we saw on side streets these little cafes were for quick eating, not for dining. Still, the selection was good and these were seemingly popular due to the affordability. If one is working in the neighborhood, this would be a good place to shop. Quick, economical and close by. 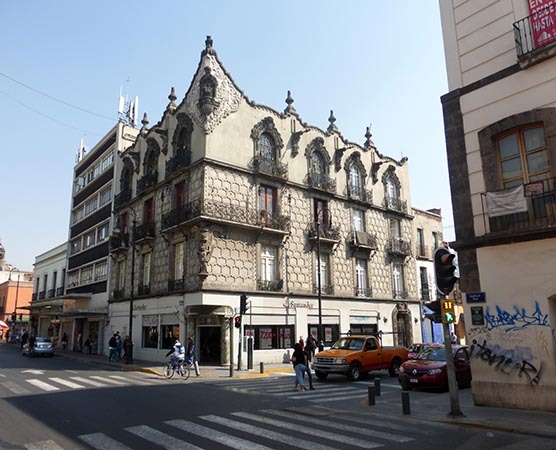 Even though our visit to Mexico City was brief, only about 4 nights, not only would we would like to return and see more, we would recommend this city to travelers who - like us - are not the city type!